According to the report carried out by Joaquín Maudos (Professor at the University of Valencia and Ivie Research Deputy Director) and Walter Garcia-Fontes (Professor at the Pompeu Fabra University), the activity of the supermarket chain Mercadona in Catalonia generates an economic impact of 2,494 million euros in terms of income, accounting for 1.1% of the region’s GDP. In addition, its impact on employment amounts to 64,255 jobs, which represents 1.8% of total employment in the Spanish region of Catalonia. The report highlights that over the total income generated by Mercadona in Catalonia (2,494 million euros), 25.8% (643 million euros) are direct impacts, mainly corresponding to salaries, rents and benefits, 53.5% are indirect impacts (1,334 million euros) and 20.7% induced (517 million). Over the total impact on employment (64.255 jobs), more than 20% corresponds to Mercadona’s employees in Catalonia (12.895), while approximately 63% to indirect jobs and over 17% to induced (representing a total of 11,000 workers). Therefore, for each euro of income (salaries, rents and benefits) generated by Mercadona supermarkets in Catalonia, four euros are additionally generated in the Catalan economy. Also, for every job produced by Mercadona, almost five are created in Catalonia as a result of its purchases to other companies and investments. 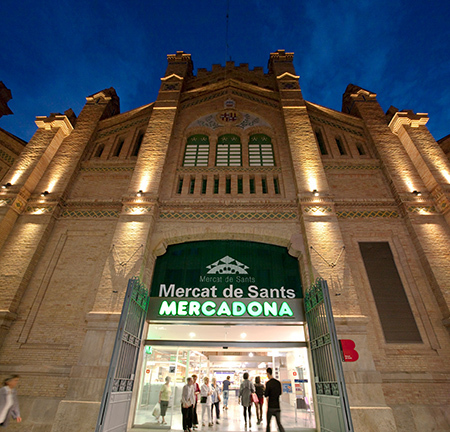 In 1993, Mercadona opened its first store in Catalonia, in the city of Lleida. Since then, it has expanded its activity and now has 259 supermarkets, 2 warehouses located in Abrera and Sant Sadurní D’anoia and, as of 2017, it has 12.895 workers in the region.